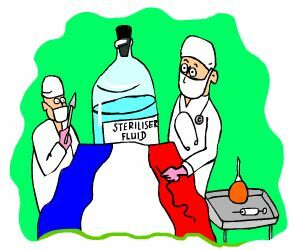 The verb in French for sterilize is the regular ER verb stériliser. If you take many an English noun ending in -ATION, drop the -ATION and add -ER you have a French verb! Hundreds of words can be formed like this! Who said that you cannot learn 200 Words a Day!? So take the English STERILISATION (use the English spelling with an 's' not an American 'z'. Drop the -ATION and add ER. To remember this word imagine that you STERILISE the French flag. The French flag and colours remind you that the word is similar to the English. A visualization like this enables you to easier remember and recall the word stériliser. Combining such a visualization with a cartoon Memory Trigger makes it easier still to remember. sterilize! stérilise ! stérilisons ! stérilisez ! ⇒Stériliser is a regular French ER verb conjugated with the identical pattern of verb endings as 5,000 regular ER verbs. ⇒Learn stériliser and it will reinforce the pattern for ALL those other regular ER verbs. ⇒Repeating the conjugated verb tables aloud will better embed the patterns into your long term memory. ⇒ Bookmark it now!... so that you can return to it with a click. ⇒ You can get a weekly email sent to you too - free - with these Daily French Lessons. ⇒ They feature French verbs like the French for sterilize - stériliser. ⇒ You can more easily remember words like the French for sterilize - stériliser using the techniques of the world's Memory Masters.